Microchips Are Mostly Composed Of What? We’ve heard more than a few people crack jokes about how there is an expiration date on their bottle of water; after all water doesn’t really expire in the sense that perishable goods spoil. We’ve also heard others try to explain the date stamped on the bottle with explanations like perhaps the plastic breaks down over time, and the expiration date is more concerned with the age of the bottle than the state of the water. 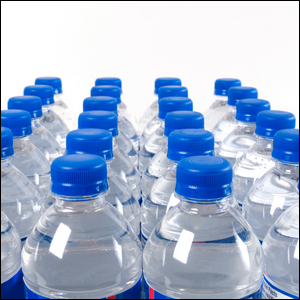 While it’s certainly true that certain plastic types will degrade over time, the real reason water has an expiration date has nothing to do with water going stale nor with leaching plastic and everything to do with New Jersey. Back in 1987, the New Jersey legislature passed a law requiring all food products sold in the state to carry an expiration date of two years or less from the date of manufacture. One of the side effects of the law was that products that previously carried no expiration date (like water bottles) were then required to have one. Rather than deal with the logistics of only stamping some of their bottles and then ensuring they were separated and shipped only to New Jersey, bottled water producers simply started stamping all of their water with a two year expiration date to comply with the new law, thereby, avoiding any sorting hassles or potential legal problems resulting from shipping unlabeled bottles into the state.